In 25 words or less: Melodic power metal at it’s finest from one of Australia’s premiere metal bands. Australia has some truly world class metal bands that more than hold their own on the world wide stages Just on four fingers, you have Voyager from Perth, Lord from Sydney and Melbourne’s duo of Eyefear and Black Majesty. Whilst Voyager have been causing a ruckus this year with their new album The Meaning Of I, it will soon be the time of the other three, who either have albums released, or in Lord’s case, an album due to soon be released. 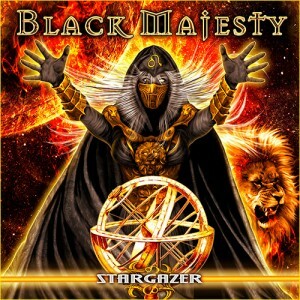 So onto the matters at hand, Black Majesty and their new album Stargazer. Well for the unsuspecting, new album Stargazer comes with explicit warning down the CD spine – Melodic Power Metal. And yes, you better believe that’s what Black Majesty deliver, European styled power metal at it’s finest. Personally, I come from a musical upbringing of glam rock, melodic rock and power pop at it’s catchiest, so when it comes to metal, the bands that are high on melodic moments will always win out. Black Majesty are one of those bands that just seem to perfectly capture my ideal style of melodic power metal. Stargazer is the bands 5th studio album and takes me back to their first couple of releases, Sands of Time and Silent Company, which are my favourite Black Majesty albums. Compared to the previous two Tomorrowland and In Your Honour, which both had a heavier and darker feel, the emphasis on Stargazer is massive choruses and super melodic guitar work. On a song such as Journey To The Soul, the band almost venture into straight up melodic rock territory with perhaps one of their most accessible songs they’ve recorded yet. Well, that is, behind their cover of Jon English’s Six Ribbons, which they did on Silent Company. Vocally, John Cavaleire is world renowned as one of the southern hemisphere’s premiere vocalists and Stargazer sees him once again in top flight, soaring on a track like Lost Horizon, or tapping into pure emotion on the haunting intro of Symphony Of Death, which then escalates into full blown metal, displaying in one song, his entire vocal range. There’s a reason why the twin guitar attack of Stevie Janevski and Hanny Mohamed are endorsed by Jackson Guitars, they are truly world class, phenomenal players. Whether it be creating lead breaks nearly as memorable as the songs choruses themselves, delivering truly blistering guitar solo’s at breakneck speed or hitting you between the eyes with riffs such as on the Australian bonus track Ariel, that immediately had me thinking of George Lynch era Dokken. For lovers of fast and furious metal, they’ve got you covered with tracks such as Edge Of The World and the Iron Maiden style galloping of Holy Killers. 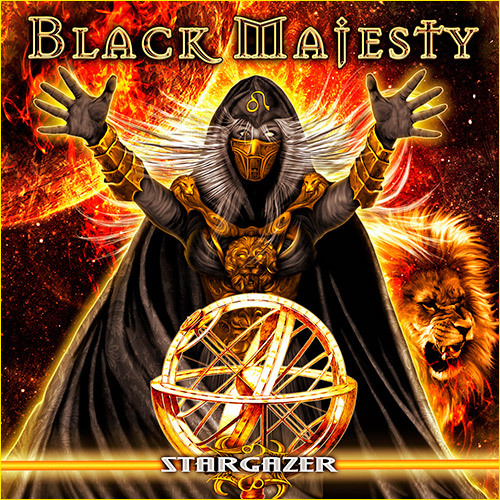 Five albums in, Black Majesty are well established in their sound and Stargazer is another high class example of power metal at it’s most melodic. For any lover of melodic power metal, you have to be one damn fussy person if you can’t find a whole lot to like from Stargazer and Black Majesty. Catch the guys supporting Nightwish and Sabaton on their upcoming Australian tour in early 2013!